The 82-NM route between Libreville (FOOL) and Port Gentil (FOOG) is very busy, especially in the morning and late afternoon hours. In order to accomodate all traffic, an offset route system has been put in place, featuring an INDIA Direct Route between the two airports, and a GOLF Route offset 19° to the left. Clearance for INDIA or GOLF route will be given on departure from Libreville or Port Gentil. 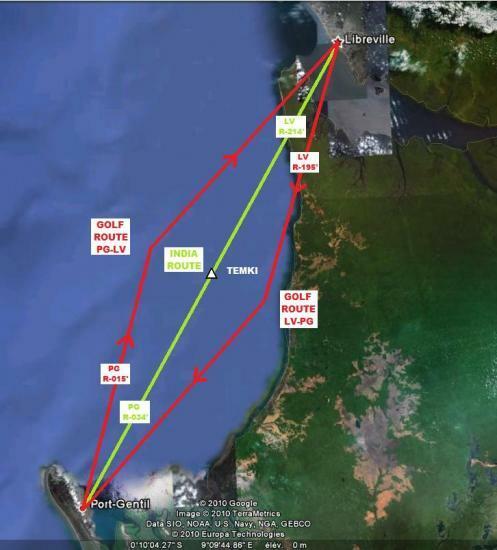 If initially cleared on GOLF Route, reclearance to INDIA Route may be possible once airborne with the agreement of both Port Gentil and Libreville approach controllers. Even though all upper-level traffic should use the ICAO African auto-information frequency 126.9 MHz, low and mid-level aircraft in Gabon normally give auto-information reports on 118.1 MHz. Anybody flying in or through Gabon below FL250 is advised to use this frequency. High helicopter traffic density below 500 feet may be expected on the Gabonese coast between Port Gentil and the Congolese border, due to oil rig activity. Occasional military parachute jumping activity over Pointe Denis, about 5 NM southwest of Libreville.